See why and how 1031 exchanges are being done today. Use this time proven procedure to make the most of today’s Real Estate investment opportunities. 10:00 am – 12:00 pm,Wednesday, April 13th, 2011. Lincoln Center, Building 3, 10220 Sw Greenburg Road, Suite 111, Portland, OR 97223. 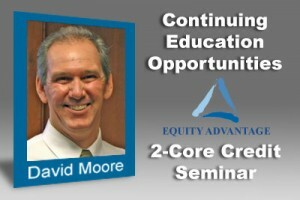 EQUITY ADVANTAGE is an Oregon Real Estate Agency approved provider of Continuing Education for 2011. The classes offered are intended to provide brokers valuable tools to get deals done today!